A little while ago I was looking through my knitting books for something (I can’t remember what, obviously) and found a book I’d completely forgotten about! 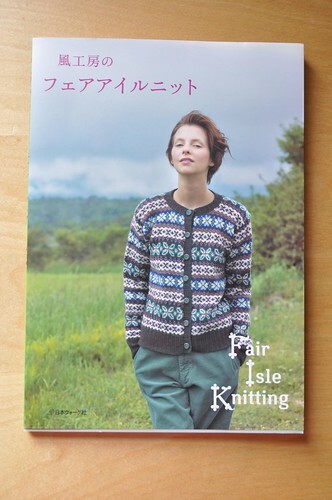 Seriously, I don’t remember buying this book at all – I might’ve bought it in Japan, but on the other hand I might’ve gotten at a Knitter’s Frolic here in Toronto. At any rate, I’m glad I found it again, because it has really awesome designs in it! The book is crammed full of patterns. I’m totally on a colourwork kick right now, at least in my head if not yet on my needles. 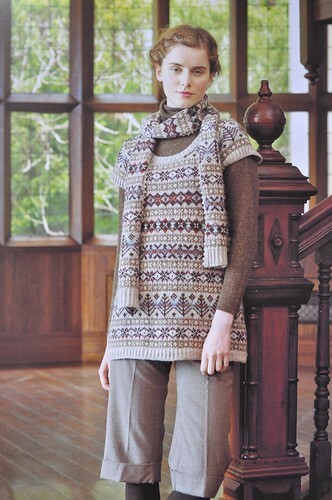 This tunic and scarf combo just look so cozy. 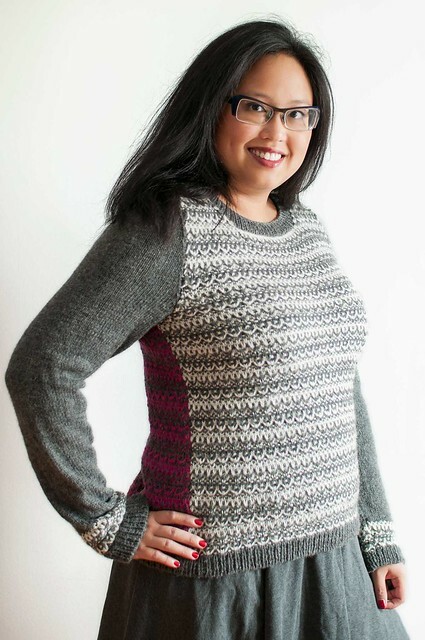 A classic yoked cardigan, with a great chart! You can’t really tell from this photo, but that’s a button-down capelet – straight across the bottom and really cool. 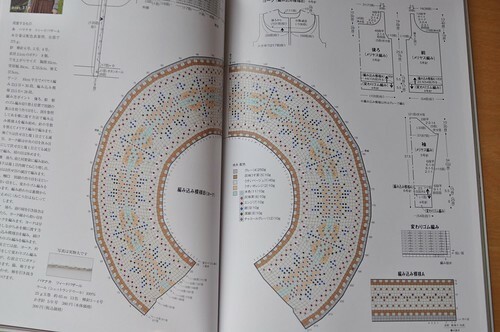 The diagrams and charts make any of these patterns totally doable, even if you don’t read Japanese (I don’t). 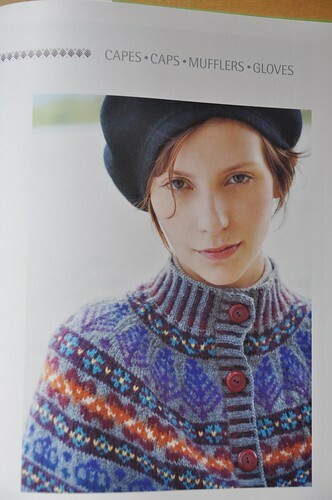 And of course, the inspiration is priceless – the garment shapes, the colourwork patterns, the colour combos. This button-up cowl would make a great intro to colourwork and steeking, if you don’t want to commit to a whole sweater. I have been knitting a bit of colourwork, although it’s stalled out a bit. You can’t really tell what it’s supposed to be yet – there’ll be some embroidery as well. Hint: it’s not supposed to be leopard print! Truly inspirational although that must be a lot of work! The capelet is beautiful! I love the cowl. I really love the Japanese books. My language skills are rusty, but they are good enough for the Japanese patterns. I love it! especially the cowl and mitten combo. All the photos were so inspiring, thank you for sharing! 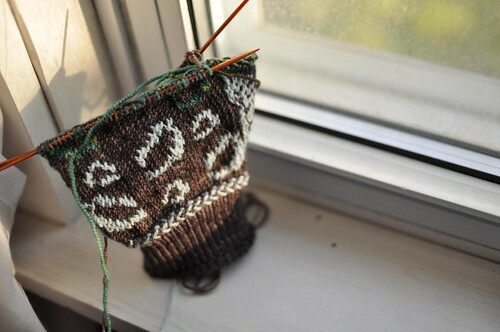 I’ve also been on a colorwork kick… in my head that is. I don’t think I’ll be able to stop thinking of that gorgeous cowl and mitten set, or of those adorable sweaters, or of that super colorful poncho! What a cool book! Diagramming a circular yoke as a circle makes perfect sense, and yet I’ve never seen that done before–crazy. Are you knitting little birds onto your mitten? So funny! I have this exact book, which I bought last year in a fit of wishful thinking. I think I may finally be up for trying my hand at one of the patterns now. Love these patterns and pictures, very inspiring! What a great find. Fair isle knitting is always inspiring. could you share the ISBN number? I’m kind of infatuated with that gray yoked sweater. I love Japanese craft books. They’re simply full of charts and diagrams. You really don’t have to speak the language to follow along.